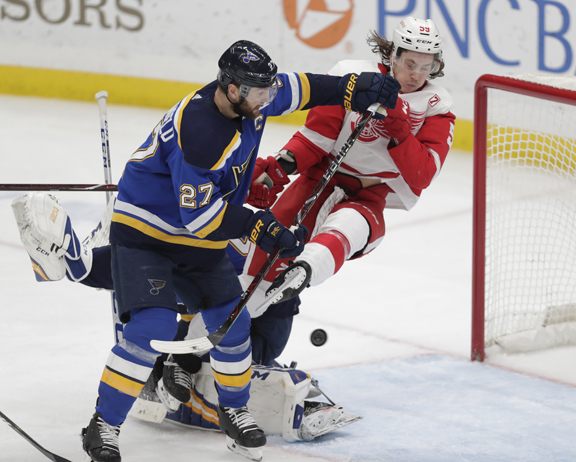 ST. LOUIS — Ivan Barbashev’s parents and younger brother traveled from Russia to watch him play for the Blues on Thursday night. The 23-year-old center made the long trip worth it — and in a big way. Barbashev completed the hat trick with an empty-netter. Vanek gave the Red Wings a 1-0 lead at the 2:05 mark of the first, banging in his own rebound off of Binnington’s pad. It was his first goal in five games.